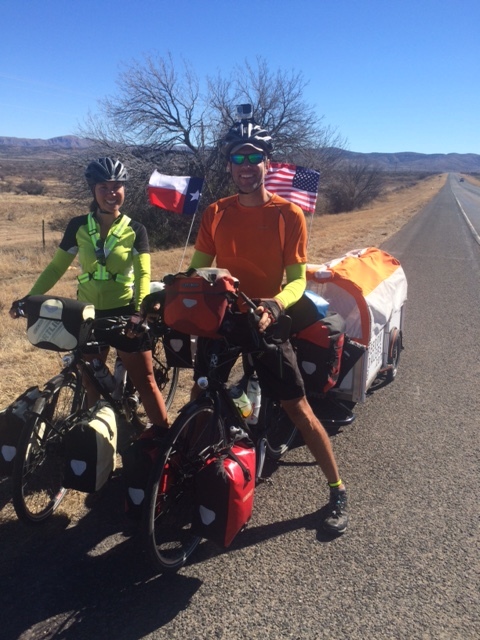 Profile Response: Georgia and Mark, Freedom Pedalers, Alpine, TX | How Will We Live Tomorrow? I spotted the two shadows a half-mile or more away, approaching on the shoulder of U.S. 90. A pair of cyclists. As we got closer I crossed the road to greet them. They were traveling heavy: four panniers each plus a tent rack on the woman’s bike; the man pulled a trailer. Georgia and Mark, aka freedompedalers, set off from North Carolina in August, headed south to Florida, crisscrossed the South and came full across Texas. They are heading to Phoenix, up into Utah and Colorado, over to Wisconsin and then west to Seattle They’ll be gone a year. Every cyclist makes his own journey, but Georgia and Mark are unique in two ways. First, their trailer is a portable doghouse; they travel with two dogs. Second, they are in their early forties. Most long distance cyclists are adventurers in their twenties, exploring life’s options. A few, like me, have careers behind us. It’s rare to find people in the generative years out on the road. But here was Georgia, Mark and two dogs, hauling everything they own across the continent on a serpentine route. This entry was posted in Responses and tagged Bicycle Touring, freedom pedalers. Bookmark the permalink.